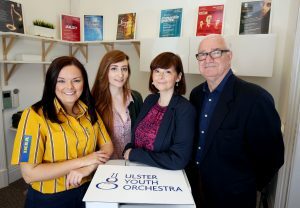 When Paula Klein (General Manager) and Ruth McCann (Administrator) returned from their annual orchestral residential course this summer they were speechless when they found that their very cramped, dark and narrow office space based on Royal Avenue had been transformed into the office of their dreams. 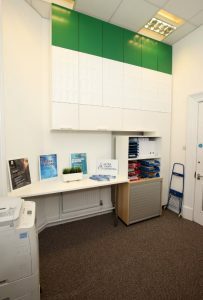 The makeover was created and installed in-kind by the team from IKEA Belfast. The new office features extensive BESTA storage from floor to ceiling, in a luxe white finish, sleek grey LÅNGFJÄLL office chairs, state-of-the-art height adjusting BEKANT desks, simplistic white frames for Ulster Youth Orchestra’s performance posters, brand new carpet courtesy of Seymour Dugan Interiors in Lisburn and fresh white walls, courtesy of Dulux Decorator Centre in Belfast. 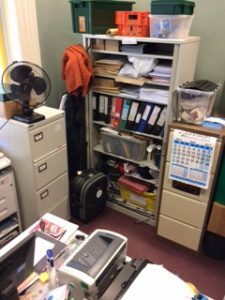 GTM Relocations enabled the whole process to run smoothly by very generously collecting the office equipment and paperwork, storing and returning it when the makeover was complete. Rachel Trousdale, Marketing Manager, IKEA Belfast commented; “Our vision is to create a better everyday life for the many people which for us also extends beyond the home environment. We know that people are spending more of their time in the workplace and IKEA has a fantastic range to make their workday just as wonderful as home. We enjoyed collaborating with UYO and the challenge of creating an environment they wanted to work in every day. 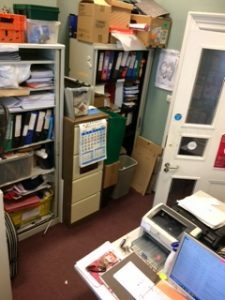 We listened to the staff’s need for more storage and floor space as their current furniture filled the entire room. 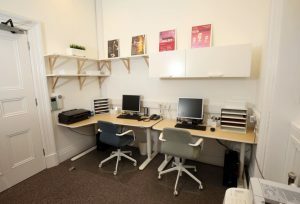 Paula added; “With UYO being a charity we hadn’t felt that we could indulge in the luxury of a new work space. The quality of our services to our young players was and still is the main focus therefore focusing on the office took a back seat. Picture by Darren Kidd /Press Eye.